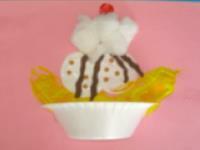 A treat that makes the perfect decoration for your ice cream shop theme. 1. Gather your material. You will need red, yellow, and white poster paint, a hole-punch, white glue, scissors, a Styrofoam bowl, a banana peel, brown Fun Foam, sandpaper, cotton balls, construction paper, and a round plastic cap. 2. 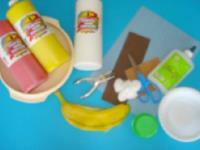 Paint one side of the banana peel with the yellow poster paint. Press it on the construction paper. 3. Press the plastic cap in the white poster paint. 4. 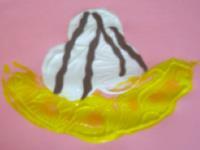 Use it to make round prints on top of the banana to represent scoops of ice cream. 5. Cut small zigzags out of the brown Fun Foam. Glue them on the scoops of ice cream to represent chocolate syrup. 6. 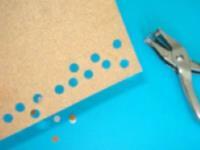 Using the hole-punch, cut tiny circles out of the sandpaper. 7. Glue them on the ice cream to represent nuts. 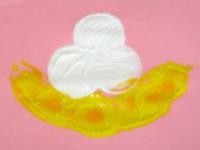 Glue cotton balls on top. They will look like whipped cream. 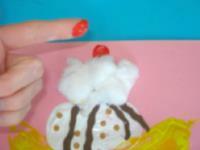 Press your finger in the red poster paint and then on top of your banana split to represent the cherry on top. 8. 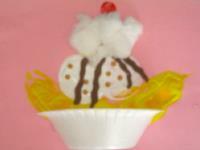 Cut the Styrofoam bowl in two and glue it under your banana split to complete your treat.